Lets see what the week of 8 February brought us. Bershka and Replay make good business realizing the fastest growth in PTAT. Bershka has the highest %PTAT increase 253,87%, followed by Replay with 190,59% and Dior 127,03%. Why Bershka is winning this week is easy to explain. Double effort of two well-known brands. Reebok for Bershka! Who decided you have to choose between being fashionable or being active? A new collection is just proving that it could be combined! The following post got 6,784 likes, 42 shares and 19 comments. Replay is again in top 3 PTAT increases of the week together with FC Barcelona, providing the team with Replay brand cloths. Looks like combination of fashion and sport today is really winning. Read here, how celebrities can make your brand fly sky high online. Dior is third this week with the new fragrance for women «Poison girl». Deliciously scandalous. I am not a girl, I am poison, they say. Seducing Camille Rowe in a commercial of Dior is just proving it. Talking about TOP 10 performers Converse stays a Facebook leader. Creative, Optimistic, Nice, Very Exciting , Ready for new achievements ,Shocking, Extremely inspiring. Thats all about Converse with its 37,509,092 followers. While being a leader, Converse has lost this week 17,680 fans. Watch out, Victoria’s Secret’s coming after you. Victoria’s Secret is again on the second position, while losing 1,393 fans since last week. Victoria’s Secret’s angels attract 26,903,757 followers. adidas is on the third place of honour with 26,616,819 fans ( + 76,820 fans a week). In their present campaign «future» the best way to predict the future is to create it, they say. This week they are getting there and tread on Victoria’s secret heels. Definitely easier wearing sneakers! On Twitter Victoria’s Secret goes up to 9 mln followers this week and gains 9,046,442 followers in total (+ 51,664 new). Elegance is in a fight with sport. Burberry and Nike are so close to each other. Burberry gains 5,825,577 Twitter followers ( + 68,073 new) and Nike owns a third place with 5,753,487 followers ( +14,364 new ). 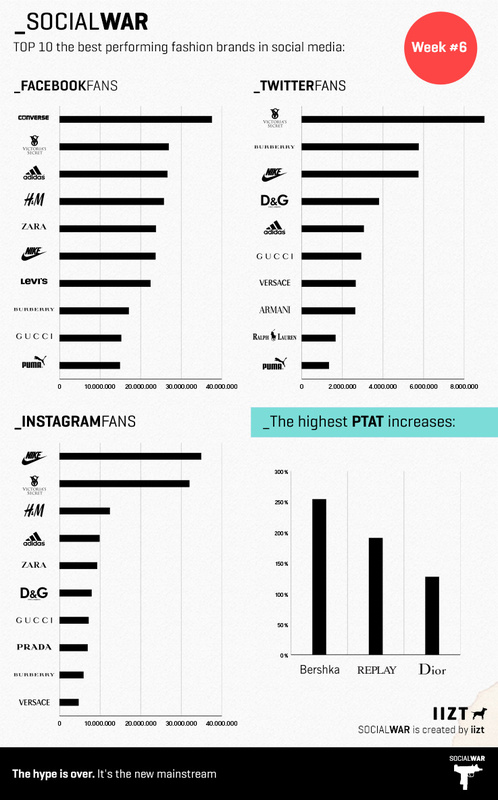 In the meantime sport is winning in Instagram and Nike is an absolute leader with 35,567,403 followers. (+ 1,166,267 new followers on Instagram last week). Nike- Just do it! Victoria’s secret is still behind Nike with 31,986,715 followers. ( +471,220 new followers), followed by H&M with 12,504,156 followers. ( +133,102 new fans).